In this paper, the authors discuss three basic steps related to the application of digital technology to reconstructive oral and maxillofacial surgery (OMFS), in an effort to improve surgical outcomes. These steps include acquiring digital images, processing images in order to build three-dimentional structures, and mapping images to patient anatomy for guided surgery. For each step mentionioned, available technologies and barriers that need to be overcome are discussed. Digital technology is still under development and it has begun to merge into surgical care. Surgeons and computer scientists are required to work together to find solutions when facing such challenges. Objective: To review the burden of oral disease by investigating the current situation of oral health status in selected countries within the regions of South, East and South-East Asia, with a view to determining which countries are performing better than others and why. Methods: The study is descriptive and observational in nature and the material is derived from existing databases. As this is a cross-sectional investigation, it offers evidence about relationships and influencing factors. If available, the longitudinal data is integrated. Results: Amongst the emerging countries, the Chinese enjoy a relatively favourable dental health status and amongst the high income countries, the South Koreans exhibit the best dental health status by comparison. In contrast to the above-mentioned perception, caries levels are relatively low and occur in the early stages in most of the emerging Asian countries investigated, even though, for the most part, caries and periodontitis remain untreated. The hypothesis that, when countries climb the socioeconomic development ladder, caries levels increase and worsen if left untreated, leading to edentulousness, cannot be confirmed for most of the developing Asian countries under investigation. Probable reasons for this surprising finding is discussed and found to be in line with current knowledge in cariology. Interestingly, the high income Asian countries under investigation perform better than many Western European countries. Conclusion: Under the specific circumstances prevailing in the Asian countries under investigation, a preventive and tooth preserving dental strategy for the entire population should offer emerging countries great opportunities to maintain a relatively low level of caries. Utilising a strategy of this ilk, these countries could achieve improved dental health across the population with comparatively low resources. Objective: To review the current oral health status and oral health care models in China in an effort to provide recommendations for the future implementation of these models. Methods: A systematic literature review was conducted. The Medline, EMBASE, CNKI and Wanfang databases were searched for English and Chinese articles reporting relevant data from 1949 to the present. Data from three national oral health epidemiology surveys, Chinese government reports and national statistics yearbooks from 2011 to 2015 were also included. Results: The oral health status of preschool children were significantly improved over the past 10 years, while caries experience among 35 to 45-year-old and 65 to 74-year-old groups showed an increase in 2005. The status of poor oral hygiene was observed for both adolescent and elderly groups. The ratio of dentist-to-population in China was reported as 1:10,000 in 2009, which was much lower than that of developed countries. The workforce of the dental service is distributed unevenly and remains insufficient for such a highly populated country. Although the need for dental treatment was perceived as high, the true demand for dental service in China was relatively low and not seen as critical. This situation clearly did not reflect so well with true oral disease conditions. There are several basic social medical insurance systems available in China, which covered most of the population's need for medical attention, but seldom covered dental treatment. 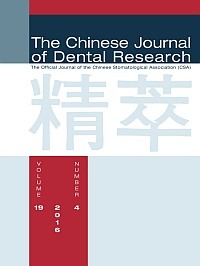 Conclusion: National oral health policy in China should emphasise oral health promotion, especially in school education for children and young adults, to further strengthen daily toothbrushing, use of fluoride toothpaste and dental floss, and actively promote annual oral health examination. Oral health management should focus on cost-effective primary and secondary prevention with the long-term goal of maintaining oral health. Objective: To investigate the current state of genetics education at the Fourth Military Medical University (FMMU) and compare it with other dental schools of China. Methods: Detailed information about the history and current education status of Oral Genetics in the FMMU were collected and questionnaires were completed to acquire the feedback of twenty-seven students on the course. In the other thirty-five dental schools including the capitals of twenty-five provinces and four municipalities in China, information about the oral genetic course were collected by a telephone survey. The contents of survey included whether or not the Oral Genetic course is offered and some basic information about the curriculum (such as the content, hours, teachers' background and teaching methods). Results: Among a total of thirty-six dental schools investigated, six of them (16.7%) offered the Oral Genetic course or related lectures/seminars. The length and contents of the curriculum vary among these schools. The FMMU offered the oral genetic curriculum both to undergraduates and graduated students. Their teachers had a broad range of backgrounds, such as dentistry, biology, genetics, and biochemistry. The students considered the Oral Genetics course to be helpful for their future professional careers. Conclusion: Genetic education in dentistry in China is still at a preliminary stage. More effort must be paid to spread the knowledge of Oral Genetics in China. In addition, domestic and international communications and networks for Oral Genetics should be set up in the near future.